With the world economy in near shambles and a steady slow growth, the only thing anyone can hope for, it was only a matter of time before destinations of fun and leisure began showing signs of distress. Many travelers also are having second thoughts about taking a trip or postponing their travel plans indefinitely. That time appears to be now as economic misery in European nations like Greece and Italy intensifies along with risks of a double dip recession for some countries. This means that some travelers are staying at home. As Americans and other travelers worldwide continue to struggle with financial difficulties, it is clear that many are shying away from adrenaline-fueled adventure trips and expensive family vacations and opting instead for cheap vacations at home, or “staycations” as they have become known. So while Globetrooper devotes nearly every waking minute to those that do have the time, desire and resources to go on a trip around the world, it is inevitable that some of us will be staying at home for a while longer. Never fear, there are ways to enjoy not traveling or the ‘Staycation’ as we call it. Though, this plan of action may seem like a depressing last resort for some, especially those that long to travel and see the world. There are strategies you can use to make a staycation in your own backyard an enjoyable experience. One of the most vital ingredients to creating a fun, desirable staycation has to do with mindset. If you’re moping around about that missing bonus and crying over dreams of Las Vegas, Disneyland, or the beach, you have an absolutely no chance of making your local vacation a success. Many times in life, adversity breeds opportunity. You have to get off of your high-horse and kick those vacation blues. 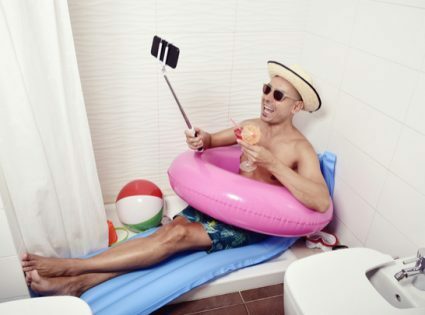 If, you commit yourself to a good attitude and some well-thought planning, you might be surprised to find that your staycation ends up ranking at or near the top of your collective vacation experiences. Most people have a routine they go about in their everyday work life. They get up, shower, have a cup of coffee, and make the same commute to their place of employment. What many people don’t realize is that they have a similar routine in their free time, too. The routine might be catching a movie every Friday or Saturday at the same theater at relatively the same time every week. Sometimes it’s the same cycle of two to four restaurants with the same atmosphere and the same staff. While these familiar places may offer an atmosphere of relaxation that can help you unwind after a long week of work, they are big “no-nos” when planning your staycation. So try to buck the familiar habits. When you usually go on vacation, you try new things. That’s what makes a vacation interesting. A local vacation should be no different. It is critical that you avoid your usual stomping grounds when you plan your local getaway. One tip to mimicking the feel of a long-distance getaway is to stay in a hotel. Either in your hometown or in one a few towns over. This can create a sense of escape that can be one of the most crucial elements to enjoying a staycation. Another way to create the illusion of “the getaway” is to play the tourist role in your own area. Most towns have a tourist information center glutted with sight-seeing activities the locals don’t even know about. You may be surprised to find that the local towns in your area have a rich history just waiting to be explored. Break your usual routine of movie-going and do an activity you don’t generally do. This can be as simple as a game of miniature golf or barbecuing at the lake or a local park. Check to see if there is a local comedy club nearby. Or, go to a rock concert, do something wacky and different that you wouldn’t normally do. See if there’s a company nearby that offers hot air balloon rides or something crazy like that. If you have children, don’t just take them to a water park, but get involved. Nothing can add some joy to your staycation and break up the monotony of everyday life like a little thrilling terror. And, racing down a sixty-foot water slide can definitely get your adrenaline going. If you’re not used to that sort of thing. It may surprise you, but taking pictures and video recordings of your activities can greatly enhance the overall experience of a local staycation. Just the act of posing for pictures can inspire the feeling that you are actually on a vacation regardless of where you’re taking it. Being on guard for a potential photo opportunity can help you stay mentally involved in your local staycation. It can give the feeling of authenticity and originality. If most people had their way, the time and the means, they would certainly opt for an expensive trip to Europe or Mexico. Instead of a staycation in their own backyard. After all most people come to Globetrooper to find travel partners and companions for hiking, touring and great adventure escapes and it is easy to forget that some travelers cannot. However, if you commit to getting the most out of the experience, you may be surprised to find that your staycation ends up ranking right up there with some of the best you’ve ever had. Then when times are better you can head out into the wild and appreciate the trip so much more.